ATHENS, Ga. (AP) — Middle Tennessee quarterback Brent Stockstill is placing an impossibly high demand on the Blue Raiders in Saturday’s game at No. 3 Georgia. Stockstill said that’s what it will take for the Blue Raiders to have a chance against a deep Georgia team off to another strong start. 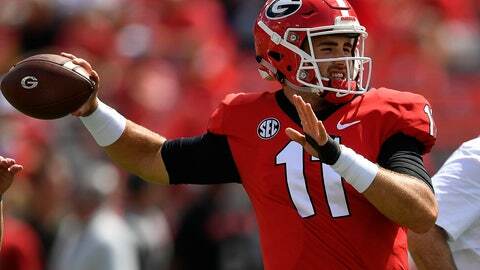 Led by quarterback Jake Fromm, the Bulldogs (2-0) showed in last week’s 41-17 win at South Carolina they have the talent to again contend for Southeastern Conference and national championships. That presents a big challenge for a Middle Tennessee program that has a history of wins over Power 5 teams but is 0-15 against ranked opponents. “We have to play perfect,” said Stockstill, the son of coach Rick Stockstill. Middle Tennessee (1-1) opened the season with a 35-7 loss to Vanderbilt , another Southeastern Conference team. The Blue Raiders’ list of wins over Power 5 opponents includes Syracuse last season, Missouri in 2016 and Georgia Tech in 2012. They’ve come up short against ranked teams, including a 29-10 loss to No. 8 Georgia in 2003 and a 37-10 loss to No. 2 Alabama in 2015. Despite losing such key starters as linebacker Roquan Smith, offensive tackle Isaiah Wynn and tailbacks Nick Chubb and Sony Michel from its 2017 SEC championship team, Georgia has enjoyed another strong start. The Bulldogs have topped 40 points in each of their first two wins. Fromm retains solid hold of the starter’s job while sharing time with freshman Justin Fields. Tailback D’Andre Swift and wide receiver Mecole Hardman are new big-play leaders of an offense that has shown impressive depth and speed. Georgia coach Kirby Smart has taken advantage of his team’s depth this week with “good on good” practice situations as a complement to more traditional work against the scout team. Smart’s goal is to have first- and second-team players continue competitions for starting jobs and playing time. Brent Stockstill, a senior, has thrown at least one touchdown pass in 25 consecutive games. The left-hander threw for 407 yards and five touchdowns in the Blue Raiders’ 61-37 win over UT Martin last week. It was his third career five-touchdown game. Georgia is paying Middle Tennessee $1.7 million, the most it has paid to have a team play at Sanford Stadium. Smart says he knows fans enjoy games against such big-name teams as Notre Dame, which will play at Georgia next season. He says he’d support the SEC adding a ninth conference game each year. Georgia kicker Rodrigo Blankenship rotates two pairs of cleats, for home and road games, that he calls his “pink slippers” and “silver bullets.” Silver bullets? “Well, they’re silver and it’s just kind of catchy,” he said. Rick Stockstill, 60, is in his 13th season at Middle Tennessee. He has the longest active tenure in Conference USA and tied for the sixth-longest term in the nation.